Steef-Jan Wiggers, a prominent Microsoft MVP, one of the BizTalk Server community leaders and the guardian for the BizTalk TechNet Wiki articles, has spent considerable amount of time and effort evangelizing Nevatech Sentinet product. Steef-Jan saw the value of the service virtualization concept for SOA Governance and API Management that was implemented in the Sentinet product. He decided to bring his knowledge and experience with the product to the world-wide Microsoft BizTalk integrators community over the large series of his technical articles posted on his personal blog site and Microsoft TechNet Wiki. In this blog I am going to list all Steef-Jan’s articles alone with the short descriptions and complete links. I also want to demonstrate how Steef-Jan brings his articles through the evolution, complexity and ultimately raised value of the use cases he implemented with the Sentinet. In his first article Steef-Jan talks about the evolution of the service virtualization concept found in the discontinued Microsoft open-source project, Managed Services Engine. He describes how this concept matured in the commercial product, Sentinet. Basic Sentinet components and their configuration Wizards are demonstrated. 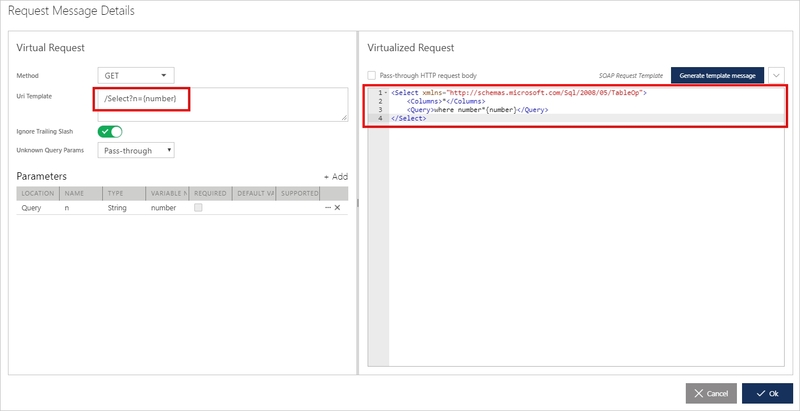 In the second part Steef-Jan introduces a simple WCF SOAP service application that is virtualized through the Sentinet Node and as a virtual service exposed to an end-user consumer application via simple a Basic Http binding. 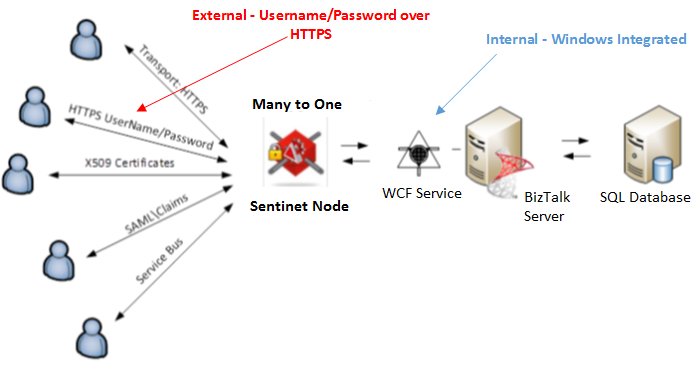 Exposing backend WCF business service through the Sentinet Node gateway helps to protect the business service and its data from direct access, and to enable it with automatic security, access control and monitoring. Steef-Jan demonstrates how to use Sentinet Administration console to register the business service in the Sentinet services Repository and how to graphically design a virtual service that will be hosted and remotely started on the Sentinet Node gateway. Once the setup is complete, a test client application sends test messages to his service application via Sentinet. In the 3rd part of his articles Steef-Jan demonstrates how to remotely configure Sentinet Node to expose the same WCF SOAP service as a lightweight REST API. Using Sentinet Administration console’s User Interface and with zero coding, he creates a mapping between operations of the existing SOAP service and REST API resources. As a result, end-user consumer applications are using REST API to access protected WCF SOAP business service. Fiddler application is used as a test client application that sends REST API request and receives REST API response, while Sentinet provides messages transformation and end-to-end real-time monitoring and recording of the message exchanges. In the 4th part of his articles Steef-Jan introduces BizTalk Server as an ESB application. BizTalk Application provides WCF SOAP interface to access business workflow and business data. He highlights that a single BizTalk service deployed with some internal Windows Integrated security can be exposed externally in many different ways without altering BizTalk application. Specifically, he demonstrates how to remotely configure Sentinet Node gateway to expose his BizTalk service via username/password authentication over SSL. In addition to proving use case with the username/password authentication, Steef-Jan demonstrates how to configure Sentinet Node with the graphical Access Rule that allows authorization of only specific username/password combination(s). Testing of the end-to-end scenario is demonstrated using SoapUI tool. In the 5th part of his articles Steef-Jan extends the previous use case, where he adds additional virtual endpoint to the Sentinet Node that makes his BizTalk service available via X.509 certificates security. He demonstrates how to configure Sentinet with the new endpoint, and how to secure this endpoint with the new Access Rule that allows only specific client X.509 certificate(s) to access underlying BizTalk service. In his next article, Steef-Jan further extends the previous use case, where he adds yet another virtual endpoint to the Sentinet Node that makes his BizTalk service available via federated, SAML-based security. He demonstrates how Sentinet is configured with the trust relationship with the SAML tokens Issuer (Microsoft Azure ACS in his case), and how Sentinet virtual endpoint is configured with the Access Rule that requires specific custom claims about the end-user. In part 7 Steef-Jan introduces Microsoft Azure Service Bus, describes its basic fundamental concepts and the benefits to expose internal BizTalk services outside of the corporate networks without any changes to the corporate firewalls. 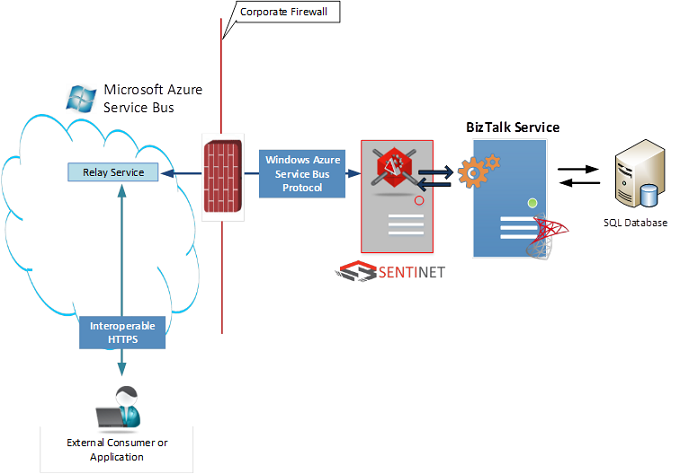 He uses the BizTalk application setup from his previous articles, and shows how to expose it outside via Sentinet Node and Microsoft Azure Service Bus with zero changes to the BizTalk application itself. 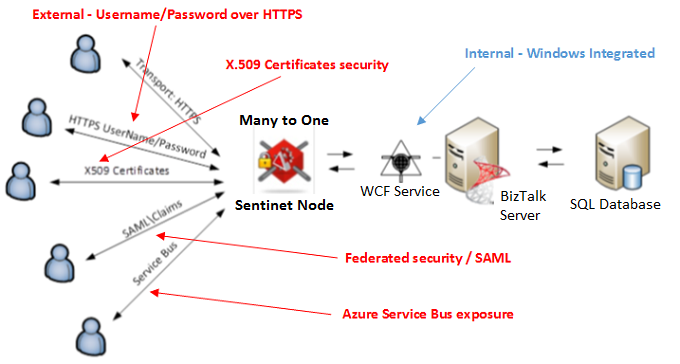 Sentinet Node is remotely configured with the credentials to connect to the Azure Service Bus, and with yet another Sentinet virtual endpoint that transparently makes the same BizTalk service available via external Service Bus address. Combining together last 4 articles, we can see how Steef-Jan configures his BizTalk service application via the variety of different security and communication models working side-by-side with zero changes to the BizTalk application itself. Authentication, Authorization and real-time monitoring of the message exchanges is demonstrated throughout articles in his series.